Two Identical Lessons per Sheet: There are two identical lessons on most of the printable worksheets. Why are there two identical lessons on each sheet? It seems like a odd idea now and I am having trouble remembering why I decided to make them this way, but I suppose the second lesson could be saved and used a week or two later or given to a second student. Dotted, Hollow, Boxes, and Practice: The letters are either dotted or the letters are hollow. One of the worksheets with dotted letters also have individual letter boxes with a starting dot. Each letter style, dotted or hollow, will have a practice worksheet. 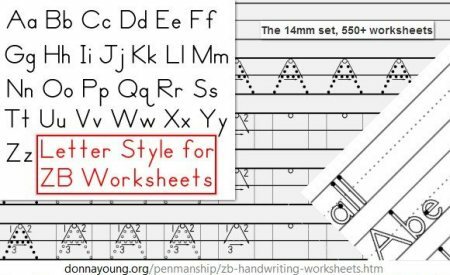 The dotted letter worksheets have both tracing and practice worksheets. The hollow letter worksheets have starting dot. Below is a photograph of my two copies along with an old yellow ruler. As you can see, the height is just over 1/2 of an inch or 14 mm. The letter size might vary a little from person to person.